Bishop’s Stortford’s big win against Chinnor 43-12, along with Launceston’s defeat of London Irish Wild Geese 27-23 ensures the Reds will be playing in National League 2 South next season. For the Cornish All Blacks they will have to win their final game at of the season at home to Shelford on Saturday to ensure survival. With Chinnor at home to already relegated Exmouth and the Wild Geese at play-off chasing Ampthill & District it promises to a nervous end of season at Polson Bridge. With Neil Bayliss having been announced Director of Rugby at the All Blacks next season and his new coaching team been put in place, Tom Rawlings has announced his departure from the club at the end of the season. Tom had been assisting former DoR Spike Rainford as forwards coach but had been given no role within the new set-up. I hope Launceston can avoid the drop as the derby matches between them and Redruth are very much part of the Cornish rugby landscape. There were some catch up games played over the Easter weekend in the regional leagues. In Tribute South West 1 West as expected Chard pipped both St. Austell and Camborne to the play-off spot behind champions Weston Hornets. Camborne rounded off their league program with a fine win at Clevedon 37-17, and yes this time the posts stayed up! Tries for the Cherry and Whites were scored by Alex Ducker (2), Dave Roberts, Dean Pascoe and Rob Floyd with Ducker kicking three conversions and a couple of penalties. Wadebridge Camels put up a good showing at Chard losing by just a point 27-26 on Easter Monday. Last Wednesday Camborne booked their place in the Cornwall Cup Final with a 27-8 win over Penryn, despite trailing the Borough 8-3 at half-time. Josh Chambers scored a try for Penryn with Rob Banks kicking a penalty to a Grant Thirlby penalty. Second half Camborne upped the tempo scoring tries through Cameron Bone, Thirlby, Dave Roberts and Will Webster with Thirlby and Mankee each adding a conversion. It’s Camborne vs. St. Austell in the final on May Bank Holiday Monday 5th May at Redruth RFC kick-off 4-15 pm. That game will be preceded by the Clubs Cup Final which will be between Perranporth and Liskeard-Looe. Liskeard-Looe won the battle between Cornwall 1 and Cornwall 2 Champions defeating Illogan Park 20-17, whilst Perranporth defeated Helston 18-8. In Tribute Western Counties West, Teignmouth defeated Penryn 26-12 in the Borough’s penultimate game of the season to book a play-off place with Matson for a spot in South West 1 West next season. St. Ives completed their program on Easter Monday going down at Kingsbridge 91-5. In Tribute Cornwall & Devon League Hayle and Pirates Amateurs both rounded off their league programs with defeats in Devon, Hayle at OPM’s 23-7 and the Ams at Crediton 55-10. Congratulations to Bodmin on their play-off win on Saturday 17-15 over Totnes to make it into the Cornwall & Devon League next season. See my previous blog entry about the game. The Cornish Pirates slipped to another defeat on Saturday in their penultimate Championship fixture against Bedford Blues 48-36. Easter saw some traditional Easter rugby with both Old Dunstonians and Imperial Medics making the trip down and by all accounts a good time was had by all. 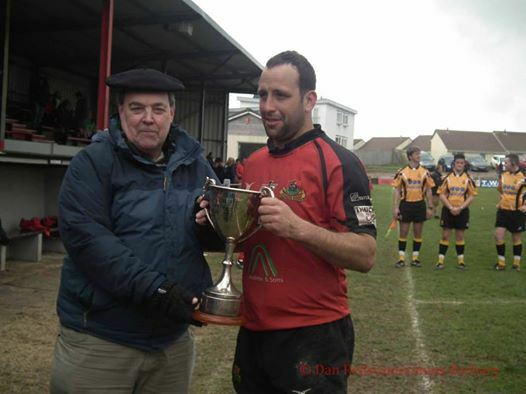 Saltash enjoyed the visit of their friends from France Buzançais with games between the two clubs on Saturday followed by a mixed team taking on a Plymouth Combination XV on the Sunday. Success too for Saltash and the Penryn Easter 7’s defeating the Kernow Kingers in the final and their colts who won the Cornwall Colts Cup against Newquay Hornets at Wadebridge 13-6. A great day at Redruth on Good Friday when a big crowd turned out to salute Craig Bonds, Paul Thirlby, Damien Cook and Darren Jacques in the testimonial game against a Cornwall Select XV. 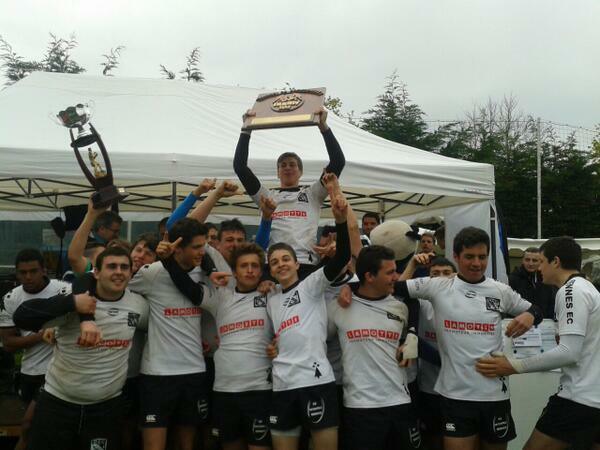 A mention for the Under 17 tournament which took place in Quimper in Brittany this weekend. By all accounts a great success with Plymstock Albion Oaks representing the south west, against teams from France and Belgium. Overall winners were once again Rennes. It would be good to see one or two Cornish sides participating in 2015. Tough one for Tom Parker and his Vannes side in the last sixteen of the Jean Prat trophy in France, a loss at home 16-13 to former French Champions Montauban means they have it all to do in the return leg in the intimidating stade Sapiac. Finally I’ll with finish with Redruth who won back the Rodda’s Milk Cup against Camborne on Easter Monday 31 – 7.